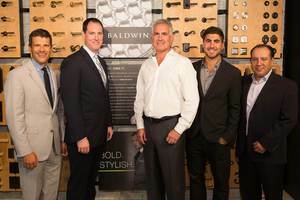 CHICAGO, IL--(Marketwired - Jul 11, 2014) - Baldwin Hardware, a leading brand of the Hardware & Home Improvement (HHI) division of Spectrum Brands Holdings, hosted the grand reveal of its new showroom last night at Studio 41. The red-carpet affair attracted architects, designers, industry influencers, media and bloggers. The new showroom is inspired by Baldwin's brand positioning and challenge for customers to "Own It." "Baldwin is all about being bold this year -- from the complete redesign of our showrooms to the introduction of striking new products like our contemporary Santa Monica collection," said PJ Rosch, Baldwin brand manager. "Studio 41 perfectly embodies this boldness and the elegant essence and cachet of Baldwin." The new showroom reflects the Baldwin brand and include new colors, functionalities and configurations that breathe new, contemporary life into the product displays. The modular redesigns incorporate sophisticated lifestyle imagery and many new displays also feature an iPad with the new Baldwin Lock Designer app, which will help streamline the sales process and educate customers on the vast array of product options through virtual mixing and matching. HHI is a division of Spectrum Brands Holdings, Inc. Spectrum Brands is a global, diversified consumer products company and a leading supplier of consumer batteries, residential locksets, residential builders' hardware and faucets, shaving and grooming products, personal care products, small household appliances, specialty pet supplies, lawn and garden and home pest control products, and personal insect repellents. Spectrum Brands employs over 13,500 employees worldwide and sells to the top 25 global retailers with products in more than one million stores. Baldwin Hardware, a leading brand of the Hardware & Home Improvement (HHI) division of Spectrum Brands Holdings, hosted the grand reveal of its new showroom last night at Studio 41 with Greg Williamson, Chief Marketing Officer of HHI, Tim Goff, Vice President of Sales of HHI and the leadership team at Studio 41.